Professor Klineberg, who has been co-directing the Kinder Houston Area Survey for thirty-one years, talked about socio-demographic developments in the Houston area and its implications for the US in the twenty-first century. For most of the twentieth century, the primary source of wealth for the Houston area has been its geographic nearness to the oil fields of East Texas. According to Klineberg, in the twenty-first century, Houston will transition into a center of biotechnology, nanotechnology, and information technology industries. If this is to become a reality, Houston needs to lure the best and the brightest into its centers of academic research, and develop ways to turn new knowledge into profitable ventures. In order to succeed in the emerging knowledge economy, the city needs to become attractive for an international mobile elite that could—at least in theory—live anywhere in the world. In this context, quality of life issues are taking on a central role for the economic success of the city as a whole. With merely one third of LA’s urban density, Houston is the most spread-out city in the US. Harris County, TX covers a land area of 1,703.48 mi² (4,411.99 km²) is the fifth largest metroplex in the US and the third most populous county, inhabited by around 4 million people. It is a city of automobiles, open spaces, and suburbs. The latter are largely the result of the post-World War Two baby boom. But despite the reliance on cars, mass transit by other means has become increasingly important. Since 2004, Houston has a light rail line, the METRORail, covering 7.5-mile (12.1 km) and catering to approximately 34,000 daily commuters, something that has long been a common sight in European cities. Demographics, Klineberg holds, is the key cause for this development. Today, less than one third of all households has children living at home. The new immigration from Asia, Latin America, and the Caribbean has prevented population loss in Houston, which has been a problem in other major US cities. Professor Klineberg is optimistic about the prospects of the US population dealing with this fact. Looking at Houston, with its great ethnic diversity, he points out that anti-immigrant sentiment is less pronounced here than in other places in America. Much of this optimism stems from what Klineberg calls the “psychology of inevitability.” While the American population as a whole is aging and today’s seniors—the Baby Boomers—are mostly Anglo (or non-Hispanic white), younger generations of Americans are disproportionately non-Anglo. Furthermore, there has also been a significant increase in interracial marriages over the last decades.6 Younger Americans today are better attuned to the reality of a more ethnically diverse society than their parents or grandparents. In Klineberg’s view, the major fault line of the twenty-first century will therefore not be race but economic class. In the knowledge economy, both in Houston, Texas, and the US as a whole, access to higher education is therefore the crucial factor for long-term economic well-being of citizens. Professor Adelt’s research interests include pop music, transnationalism, and racial politics. In the 1960s, blues music underwent a shift from black artists and audiences to white artists and audiences. With the appropriation of the blues by white artists and audiences, the genre shifted away from its former black working class base. The white middle-class embrace of certain notions of blackness stood in contrast to black audiences’ increasing attraction to new music genres emphasizing civil rights and black power, such as Soul and Funk. For white audiences, black masculinity was perceived as a marker of authenticity. Nevertheless, African American performers often resisted such forced constructions of blackness. Adelt used the American Folk Blues Festival, a music festival organized by German promoters starting in the early 1960s to illustrate the complex relationships between transnational popular culture and race during the Cold War. In the 1960s, blues music became a transatlantic phenomenon in its own way. Black American blues musicians, some of whom became expatriates, brought their music to eager European audiences. After a while, blues in an updated form was re-imported to the US, mostly through British rock bands. As an example of an expatriate blues musician, Adelt mentioned Memphis Slim (1915 – 1988), who was portrayed in the June 1966 issue of Ebony magazine while living in Paris (You can read the issue in the Ebony archives). But this was not the norm. Most African American blues performers did not become expatriates. Memphis Slim, American Folk Blues Festival, Hamburg 1972. Picture by Heinrich Klaffs. This file is licensed under the Creative Commons Attribution-Share Alike 1.0 Generic license. From Wikipedia. In Germany, promoters Horst Lippmann and Fritz Rau organized the American Folk Blues Festival, beginning in 1962. Their construction of the blues was highly romantic. It used the genre’s blackness to highlight blues as the primitive root of Rock’n’Roll. Lippmann and Rau saw the blues as a vehicle of Denazificiation and Anti-racism. In retrospect, however, they continued to deploy racial constructions that are uncomfortably close to that of the Third Reich. Adelt argued that pop culture is not always a liberating force, but can also work to uphold racial hierarchies and oppression. In Germany, positive racism in the form of appropriating the art of ‘savages’ has a long history. African bodies used in art were seen as modern, fresh, or lively. Examples of works of art in this vein include Pablo Picasso’s Les Demoiselles d’Avignon (1907), Emil Nolde‘s Dance Around the Golden Calf (1910), or the enthusiasm for American-born French dancer/singer/actress Josephine Baker (1906 – 1975). 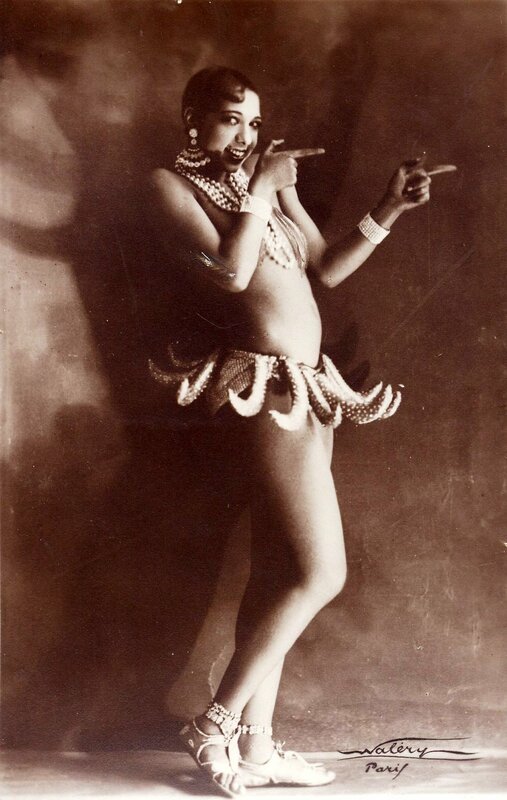 Josephine Baker in Banana Skirt from the Folies Bergère production “Un Vent de Folie,” 1927. Picture by Walery, French, (1863-1935). PD by age (Walery died more than 70 years ago). From Wikipedia. During the Third Reich, this former positive racism was replaced by negative racism, exemplified by terms such as Entartete Musik (‘Degenerate music’) (see also here) for jazz, and a fear of Vernegerung (‘Negroidization’) or Verjudung (‘Jewification’) of German culture through ‘foreign’ popular culture. Racism was also present among parts of the white German left. Here, a “fascination with the real” drove the interest in the black embodiment of suffering. Transplanting the blues to Germany brought with it certain traveling problematic racial conceptions. While the US certainly had its own historic issues with race, the blues was entering a German culture that was no stranger to racist ideas, even before National Socialism. Among these were the ‘Black Horror on the Rhine’ (“Die Schwarze Schmach“)—fear of the presence of black French troops during the Occupation of the Rhineland following World War I, the vilification of interracial fraternization in the phenomenon of ‘Occupation Babies’ (“Besatzungskinder”) after World War II, caused by sexual relationships between black American GIs and white German women. Such negative racial constructs were later challenged by Afro-German activists, for instance in the book Farbe Bekennen (‘Showing our Colors’) in 1986. After the reunification of Germany, a wave of Neo-Nazi attacks on immigrants and non-white persons conveyed an urgency among ethnic minorities and sympathetic parts of the mainstream German population to organize against racial stereotypes. Within German popular culture, Hip Hop artists, especially multi-ethnic or Afro-German Hip Hop artists, such as Advanced Chemistry (early 1990s), Samy Deluxe (starting in the late 1990s), or Brothers Keepers (early 2000s) were involved in anti-racist activism. The blues was used as a propaganda tool on both sides of the Cold War divide. The capitalist West promoted blues and Jazz as symbols of openness in contrast to the Soviet system. Nonetheless, during the early Cold War, the Jim Crow system was still very much intact in the US, and the Civil Rights Movement had not yet gained that strong a foothold. The communist East was eager to point out these contradictions, presenting blues and jazz as a signs of resistance against the inherent racism of the capitalist system. In the German Democratic Republic, blues was promoted as music of the oppressed masses, embedded into a critique of US capitalism. On the other hand, there were crackdowns on long-haired blues fans nonetheless, and racial stereotypes were not absent. When Lippmann and Rau began to organize jazz concerts featuring African American artists, for instance the Modern Jazz Quartet, they sought to give Jazz an aura of “respectability” by having artists wear tuxedos, advertising events with abstract art, and setting up concerts in symphony halls instead of small, smoke-filled clubs. As Adelt argued, this idea of having to make jazz and its performers respectable can be traced back to racial ideas of the Nazi era. While organizing blues concerts, Lippmann and Rau gave up on the concept of creating respectability and appealed to primitivist ideas instead. The American Folk Blues Festival, staged between 1962 and 1972, and 1980 to 1985, usually went for three to four hours and featured eight to ten headliners. What was presented in these concerts can be described as nostalgic blues for white audiences. Both folk music from the 1930s and 1950s blues were at this point somewhat outdated. Older blues artists, such as Willie Dixon (1915 – 1992), were rediscovered during the 1960s. In this context, there was also a conflict between older black and younger white blues performers. Big Joe Williams, American Folk Blues Festival, Hamburg 1972. Photo by Heinrich Klaffs. This file is licensed under the Creative Commons Attribution-Share Alike 1.0 Generic license. From Wikipedia. Lippmann and Rau’s posters advertising their events made extensive use of romantic primitivist imagery. The artwork often featured guitars and earthy colors, reminiscent of nameless black bodies. Overall, their design conveyed a “non-threatening” nostalgia. The events themselves even surpassed the posters in their stagecraft. To enhance the atmosphere of the spectacle, concerts sometimes featured recreated juke joints and other scenery, and African American GIs were bused in as studio audience in Germany. Here, here, and here are some videos of typical performances (you can find much more material on youtube). In 1967, Lippmann and Rau started booking Soul and Funk artists such as James Brown. With a turn towards these more contemporary forms of black popular music, the audience also shifted notably from white Germans to black American GIs. In 1965, Lippmann and Rau linked their American Folk Blues Festival to the US Civil Rights Movement. While well-meaning, in retrospect they upheld problematic racial constructions. In concert booklets, for example, blacks were presented as victims without an agency of their own. In a sense, Lippmann and Rau catered to their audience’s expectations of blues as a primitive, raw, emotional, but certainly not intellectual form of art. Some African American blues artists developed what Adelt sees as strategies to counter such forced constructions of identity. At times, they spontaneously changed playlists at their shows. Some defied stereotyping by showing off their extraordinary skills and gimmicks in musicianship, for instance on the guitar. Stage antics, appearance in decidedly flashy clothes, or the performance of novelty songs were forms of resistance against expectations. White audiences did not always take this too well. In 1965, Buddy Guy (born in 1936) was booed for playing a medley of James Brown songs. To some degree, the blues resisted against expectations of white middle class respectability. In conclusion, Adelt remarked that the appropriation of the blues by white German audiences was characterized by ambiguity. While there was great optimism about the prospects of Denazification through American popular culture, the project of transplanting the blues to Europe had a blind spot in its continuation of racial stereotypes. Adelt, Ulrich. Blues Music in the Sixties: A Story in Black and White. First Paperback ed. Rutgers UP, 2011. Balitzki, Jürgen et al. Bye Bye, Lübben City. Bluesfreaks, Tramps Und Hippies in Der DDR. 1st ed. Schwarzkopf + Schwarzkopf, 2004. Carby, Hazel V. Race Men. Harvard UP, 2000. Filene, Benjamin. Romancing the Folk: Public Memory and American Roots Music. U of North Carolina P, 2000. Hamilton, Marybeth. In Search of the Blues. Reprint. Basic Books, 2009. Hohn, Maria. GIs and Fräuleins: The German-American Encounter in 1950s West Germany. U of North Carolina P, 2002. Oguntoye, Katharina, May Ayim, and Dagmar Schultz. Farbe Bekennen: Afro-deutsche Frauen Auf Den Spuren Ihrer Geschichte. 3., veränd. Aufl. (REV). Orlanda Frauenverlag, 2007. Von Eschen, Penny M. Satchmo Blows Up the World: Jazz Ambassadors Play the Cold War. Harvard UP, 2006. Today, historian Charles Postel of San Francisco State University and a visiting scholar at Heidelberg University, visited American Studies Leipzig as part of the Fulbright lecture series to talk about the rise of the Tea Party Movement in the US. Postel, who specializes in populist movements in America, sees the Tea Party Movement as driven by a convergence of two different forces: ideology and economic self-interest. He mentioned the myth of the original Boston Tea Party of the eighteenth century in American folklore, which is widely seen as a tax revolt, but was, according to historians, much more complex, involving political ideas about freedom and economic self-interest of Boston merchants and smugglers. In order to illustrate the anatomy of today’s Tea Party Movement, Postel noted that federal taxes are at the lowest level since sixty years and that tax levels for the highest income groups have declined even sharper than for the average taxpayer. Postel held that much of the ideology of the Tea Party Movement derives from anti-New Deal conservative movements of the Cold War Era, in particular the John Birch Society, who saw social programs such as Social Security, trade unions, and the Civil Rights Movement as communist subversion of America. The enemies of those anti-New Deal conservative Republicans were for the most part moderate Republicans of the time. The John Birch Society, which was the first grassroots conservative movement in the US, achieved a victory in mobilizing for Barry Goldwater as Republican candidate in 1964. Robert Welch, the founder of the JBS, even went so far as accusing Presidents Eisenhower and Kennedy as communist agents. In fact, anyone in favor of the New Deal and Civil Rights was seen as a communist. In this video clip on YouTube, you can see Welch’s presentation (ca. 1965) of the JBS. Other leading conservative intellectuals, such as William F. Buckley, distanced themselves from Welch and the JBS. Welch and his allies, among them writer Leon Scousen, whose books have had a revival among Tea Partiers, built their own conservative movement on an anti-New Deal agenda. For them, America’s fall from grace began in the early 1900s with the Progressive Movement’s social reforms. The Birchers demanded the repeal of early twentieth century reforms, the Sixteenth Amendment, which allows for the federal government to raise an income tax, and the abolition of the Federal Reserve. They also demanded that the Seventeenth Amendment be repealed, which allows for the direct election of Senators. This was subsumed under the idea that America was a republic, not a democracy. According to Postel, Obama is actually a centrist Democrat. A health care legislation similar to Obama’s was first proposed by President Nixon in 1974. For a long time, Republicans endorsed this idea. The Tea Party Movement sees any regulation of the health care sector as socialism. If the rhetoric reminds of Joseph McCarthy and Barry Goldwater, that is, Postel says, because the John Birch Society has a revival. Leon Scousen’s books are advertised regularly on Fox News by opinion hosts such as Glenn Beck. Right-wing corporate lobbyists, including groups like FreedomWorks or Americans for Prosperity, but also think tanks, such as the conservative Heritage Foundation or the libertarian Cato Institute promote ideas similar to those of the Birchers. Overall, the Cold War Hard Right has made a comeback, and it has gained the upper hand within the Republican Party. Moderate Republicans have become a pariah within their party. [Update]: I just stumbled upon a recent example of Bircherite Tea Party rhetoric. Congressman Allen West (R-FL) suggesting that 80 House Democrats are members of the Communist Party (article from The Raw Story). Besides ideology, politics of interest play an important role in the Tea Party Movement. The size of the federal government has remained relatively stable over the last decades. Most federal spending has been shrinking in the last thirty years. The two big exceptions to this are military spending and Medicare. Most Tea Party supporters are on favor of higher military spending. Regarding Medicare, typical Tea Party supporters—older, better educated, white males—have in the past most profited from government programs. In other words, the Tea Party Movement mobilizes in the name of defending Medicare for themselves. Tea Party figures such as Michelle Bachman have argued to the effect that Obama would take funds out of Medicare to give it to younger people. Postel mentioned that the Paul Ryan Budget, favored by Republicans, illustrated this interest: those over fify-five would keep Medicare, while everyone else will have to shop in the insurance market with private vouchers. The Ryan Budget also includes tax cuts for top earners and budget cuts for social programs. This plan is proposed within the context of rising inequality within the US. While problematic for many, Postel noted that tens of millions of Americans have also benefited from rising inequality. So far, Tea Party-influenced legislation at the state and local level has fostered inequality, with a clear anti-immigrant, anti-union, anti-reproductive health, and anti-voting rights agenda. Currently, about twenty percent of Americans sympathize with the Tea Party Movement. The Tea Party Movement has links to corporate lobbyists. Postel highlighted the Koch Brothers, the fourth wealthiest individuals in the US with an industry conglomerate in petrochemicals. The Kochs bankroll the Tea Party Movement through lobby groups such as Americans for Prosperity. They founded libertarian think tank the Cato Institute, and ALEC, a legal think tank. Fred C. Koch, father of Charles and David Koch, was a founding member of the John Birch Society. Despite the involvement of the Kochs and others, Postel said that the Tea Party Movement cannot be called purely an ‘astroturf’ or fake grassroots movement. Postel also held that while the mass media often emphasize the Tea Party Movement’s anti-elite rhetoric, there is not very much of it on closer look. Rather, all political movements in the US since the nineteenth century have used some form of anti-elite rhetoric, out of necessity. For Postel, the core agenda of the Tea Party Movement is “blowing up the social contract.” While in Europe there is general agreement about the validity of some form of social contract, even among right-wing populist parties, who want to limit the beneficiaries of that social contract, Tea Partiers want to end it. To American Tea Partiers, European right-wing populist parties might look statist, which is opposite to Tea Party ideology. Many Tea Partiers call themselves ‘tenthers,’ in reference to the Tenth Amendment, which gives established the federal system giving states all rights not granted to the federal government. Postel noted that in the US, political movements have always swung for or against states’ rights and federal rights, depending on whether the legislation in question aligned with their particular agenda. Postel ended his talk noting that, ironically, the Tea Party Movement has nationalized politics more than anything else in the recent past. Charles Postel is currently working on a book chapter for an anthology on the Tea Party Movement.